Yes, well, sorry about that. It has been a difficult/hectic few months that I am starting to come out of the fog of. Don't want to give an explanation here, ask me if you want to know more. So, what's new? 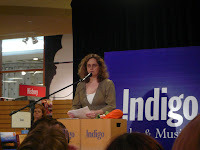 Had a fabulous Harlot sighting last Friday, as she did a book launch at Indigo Books at Bloor and Bay in Toronto. After many, many months about hearing about her talking at all these places in the US and the rest of Canada, she finally did a hometown appearance. Here she is in all her Harlotness. She was great, spoke for an hour, made us all laugh, was a very good speaker. Being a Torontonian, you do see her at various places and functions about town. But it was great to see her in an 'official' capacity. Here is Jacquie from the DKC, and Amy Singer. I was quite nervous about meeting Amy for pre-Harlot dinner, as she is the editor of knitty.com and I was having a 'We're not worthy' moment (Wayne's World). 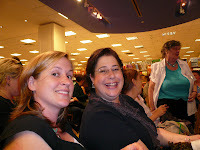 But she was fun and easy to talk to (which means a lot to the Shy Knitter) and it was great meeting her. 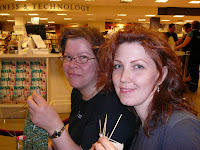 My best knitting bud Eden (thanks again for the pics) as we wait for the Harlot. We did have fun waiting, although I screwed up my lace (don't knit lace at such things, it just isn't worth the agrivation) and had to unknit 2 rows....thankfully I didn't have to rip it back. 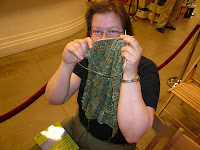 Finally, this pic.....just to prove that I am a Shy Knitter. I will post again soon. posted by shyknitter @ 2:30 p.m. So glad you're back in blogland! And it was so good to hang with you and Eden. The event was a blast!